Bloggin' 'bout Books: Another Challenge? Bring It On! Because I'm weak, I'm signing up for yet another 2011 reading challen ge. What's wrong with me, you ask? Seriously, I don't know. I just love challenges. So, for this one, I'm going for Level Two, which entails reading 10 books that have been made into movies/t.v. shows and then watching the movies/t.v. shows. Sounds fun, huh? Head on over to Reading Extensively to sign yourself up. Having just finished it, I highly recommend True Grit by Charles Portis. Move over Scout Finch, Mattie Ross is in town! 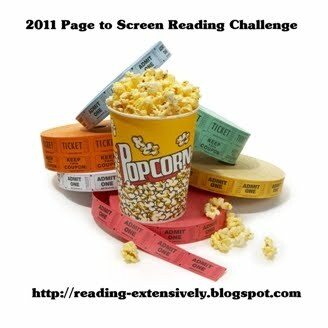 Thanks for signing up for the Page to Screen challenge! You have a great list planned. I need to read The Voyage of the Dawn Treader. I read Prince Caspian before watching the movie. Good luck with the challenge!